This article by Roxanne appeared in somewhat abridged form in the RSBP’s junior magazine, Birdlife, last year. I was born on a boat, and ever since I was a baby we have lived aboard the boat and sailed wherever we want to go. I have never lived in a house, although I have occasionally lived in a caravan or a camper van, in different parts of the world. I wonder if it is to this gipsy lifestyle that I owe my love for animals. I have always loved animals. For as long as I can remember I have wanted to be an entomologist, which is a naturalist that specialises almost entirely in studying insects. However, I am also very interested in sea animals. This doesn’t just mean fish. 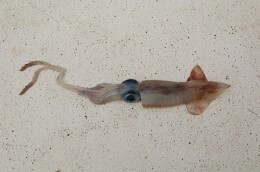 There are vast amounts of animals in the sea of all shapes and sizes and kinds. Of course, there are a lot of animals living at the bottom of the sea, but we don’t see these unless we dive, and even then only when we are in harbour. When we are on the ocean the bottom of the sea can be as much as two miles down. 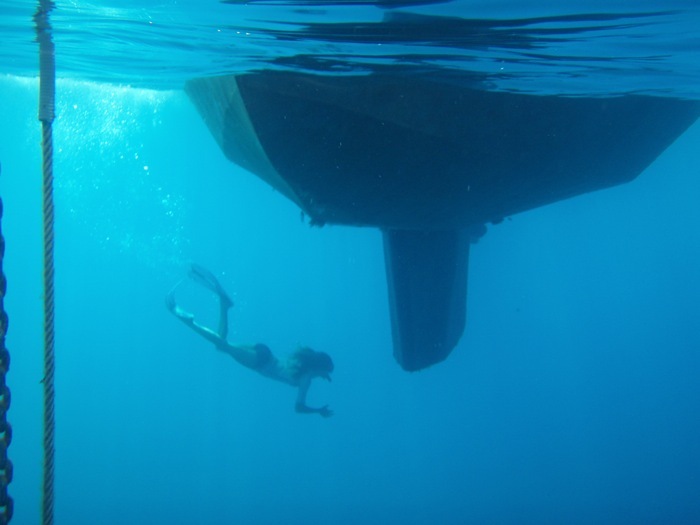 However, the bottom of our boat can become an artificial seabed. First the algae set up home on it. Then other little plants and some animals begin to grow on it. 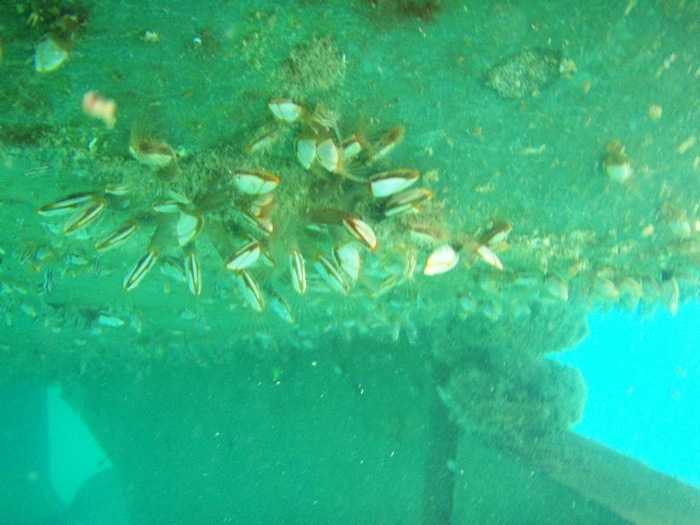 Barnacles arrive as microscopic plankton and then begin to grow on the bottom of our boat. Larval mussels and goose-barnacles come and attach themselves and grow. Some of the “weeds” which wave about in the water are actually animals. They sting when you touch them. Many of these plant-like animals are actually colonies. The plants encourage little tiny animals to join us – things such as sea lice – and then come the crabs and the shrimps which like to eat the weed and the smaller animals. Then fish begin to hide under our boat and to feed in the garden that is growing there. Some of them eat the animals, but others graze on the algae. We can sometimes hear them chomping, from inside the boat! The little tiny fish encourage bigger fish to come, and those bigger fish attract bigger ones still and they also encourage the seabirds to follow us around. A little chain of life has formed around our boat. The fish sometimes stay under our keel while we are sailing. This hides them from predators, who look up and see only our big shape outlined against the sky, and not the little ones. But they are not really safe, because we are another predator! Although I love to study them, fish are also my favourite food. I like them even better than chocolate. While we sail we trail a big hook with a lure which we make ourselves out of strips of a plastic bag. Sometimes we catch fish from our larder under the keel, but sometimes we catch tuna bigger than me, which have come to prey on the littler fish. It would be nice to keep this chain of life, but we need to be able to sail the boat, and the weeds and barnacles on the bottom cause a lot of drag. They slow us down, and they foul up the propeller, and jam the rudder so that we can’t steer properly, which is very dangerous of course. When we scrape the growth off the bottom of the boat, the food chain collapses and the bigger animals leave us too. Every animal comes to our boat more readily when we are carrying around a little miniature world. Everything, that is, except for the seabirds. 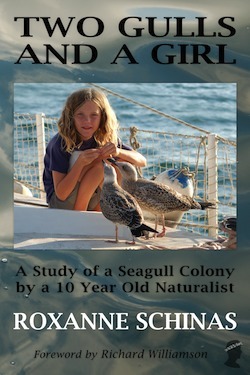 Some seabirds come to us and follow in our wake. These ones are looking for tiny plankton, and it seems that our boat churns them up. Usually we don’t see them eating, because they do it too fast. They swoop down to the water, and then they soar up again. Other birds seem to come to us merely because we are a focal point. There is no land in sight – often no land for hundreds of miles – and there we are, one little dot in a great big blue sea. No wonder they come to us! Unless it is calm they usually don’t land. They just follow us, circling round us and then disappearing behind the waves as they make wider circles, low down over the water, wandering towards the horizon, but then wandering back again. Sometimes they follow us for days. If we sail past islands the birds come out to us. 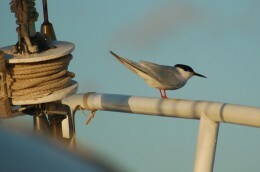 Some kinds, such as noddies, even land on the boat. My father says that he once had a row of boobies spend the night on boom while he was sailing! 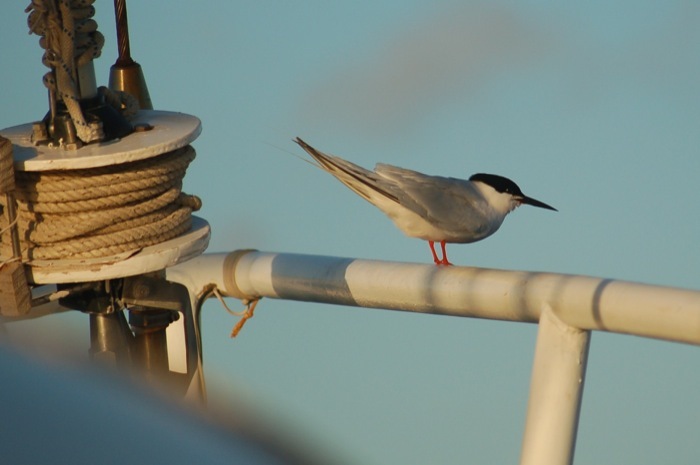 Every now and then little land birds meet us while they are migrating across the sea, and they sometimes land on our boat. We have had chiff-chaffs, other warblers, swallows, pigeons, a dove, a pied flycatcher, and even a hoopoe landing on our boat. Sometimes they stay for hours, and we offer them food. Seeds for the vegetarians and weevils and flies for the insect eaters. The chiff-chaff and the fly-catcher were so tame that they ate out of my hand and perched on my head. They perched on Mummy’s camera while she was trying to take photos! People think of seabirds as being gulls, terns, cormorants, and so forth, but actually these birds rarely venture more than a few miles offshore. 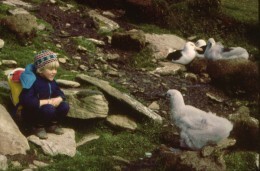 The real seabirds are the petrels, the shearwaters, and, of course, the albatross. Our boat is named Mollymawk, which is the sailors’ name for the albatross. 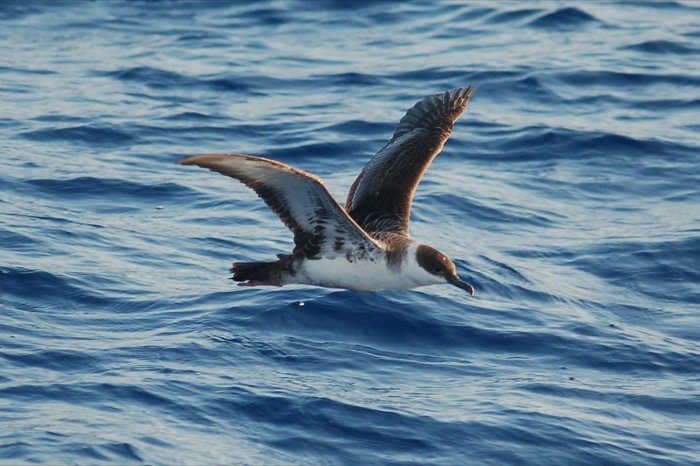 There aren’t any albatrosses in the North Atlantic, and it’s a long time since we’ve been south of the equator, so I can’t actually remember seeing them. 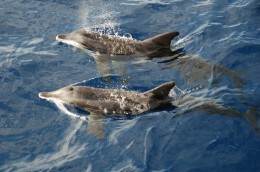 Of course, birds are not the only animals which live on the ocean. It’s just that we see them much more often than any other sort, because they are much easier to spot. When the weather is rough it’s hard to see things that are in the water unless they come right up to the boat. When it’s calm then we can look down into the clear blue water – we can see down, down, down, forever, it seems – and often we see fish below us. But you can really only have one kingdom at a time. When it is calm then we don’t see so much of the birds. All true seabirds glide on the wind, instead of endlessly flapping, and when there is no wind they just sit down on the water. Of course, they can flap and fly like other birds, but it wastes too much energy. We’re a bit like the birds. We can’t sail in a calm, and so we just sit there on the water. But we don’t mind. We don’t start our engine and waste energy. Calms give us a chance to relax and look around. I like to pull up a bucket of water and look at the plankton that you can almost always see when the water is calm. And calms are whale watching weather. Sometimes all you see is a blow, which is the puff of spray which the whale makes as he breathes out at the surface. 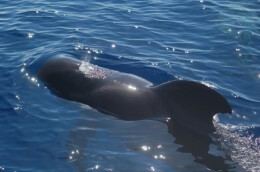 On the way from Spain to the Canary Islands we met a pod of sperm whales, and the first thing that we saw was the blow. In rough weather we might have mistaken it for the spray blown from a wave. As we watched the whale, in the distance, trying to catch sight of his back or his tail, I saw a shoal of fish jumping right beside us. “The whale must be chasing them,” I said. 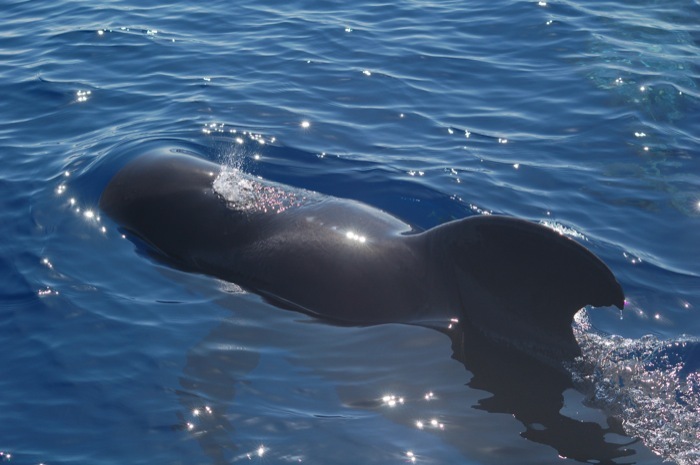 We all instinctively glanced down – and there was a whale – another whale – swimming under the boat! It surfaced right beside us. It was as long as Mollymawk. 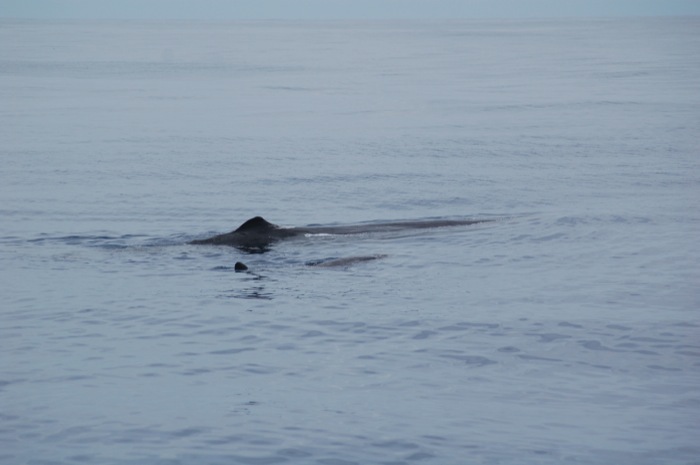 We saw the classic sperm whale’s blunt nose. He looked me in the eye! And then he sank into the water again. So why did the whales come to see us? Some people make wild guesses. They say that the whale thinks that our boat is another whale. But our boat is a hard metal box! This animal is a mammal, like us. It is not stupid! Who can think with the mind of a whale? No one. I suppose that this mystery will never be solved, but personally I think that the whale was wondering what our boat was and so he came to have a look. We were the only little island for miles around, and so we were a focal point, just as we are for the birds. 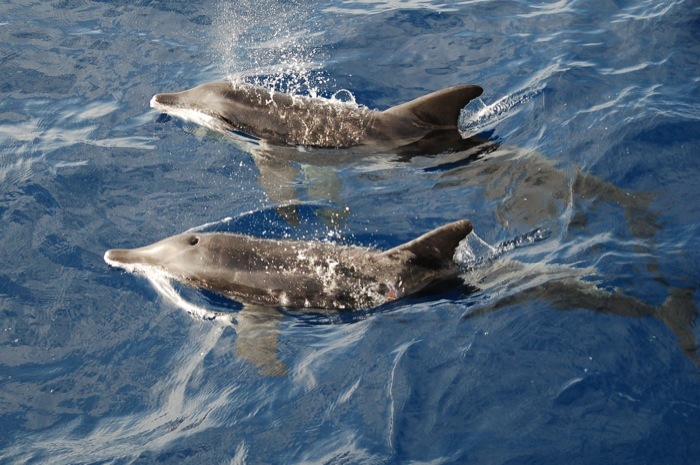 Dolphins also come to our boat, but they come more often when we are moving. Of all the animals in the sea they are the ones that join us seemingly for no reason. Not for shelter or food or even just for curiosity. They just come to be friendly and to play. In the day time they swim to our bow and they travel there. Occasionally one of them turns on its side to look up at us. They plunge down, or they dart off sideways, and we can’t see them anymore. And then suddenly they are back again. 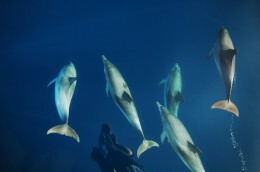 All sorts of dolphins bow ride, and they are my favourite visitors. Not so exciting as whales, but more fun because you can see them properly and they stay for longer. Almost as fun as seeing dolphins at the bow is hearing them at night. You hear a splash and a sigh, as the dolphin breathes out. Sometimes the dolphins leave long streaks of light behind them. The light is made by little microscopic plankton which are drifting in the sea. When the dolphins bump into them they make phosphorescent light. There is no other light out on the ocean, except the light of the stars and sometimes the moon. When the moon is not up the stars are very bright, but the sea is completely black. Although it is so dark the birds still fly. I don’t know if they are still fishing. I think it would be hard for them to fish at night, when they can’t see the fish, but birds have eyesight a lot better than ours. I have noticed that the shearwaters which nest on the Canary Islands do bring food to their chicks during the night . It could be that the birds fly all night because they are afraid to sit on the water. They would not be able to see if a shark came sneaking up to grab them from below! 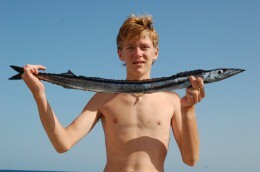 One animal that certainly can’t see very well at night is the flying fish. Flying fish really do fly! Their front fins have developed into wings made of thin clear membrane that looks almost like plastic. They can’t actually flap their wings, but they can flick themselves out of the water and glide for quite long distances. They do this to escape from their predators. 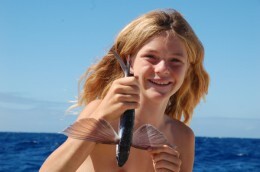 When it is windy and our boat is sailing quite fast the flying fish fly up away from us. They probably think that we are coming to eat them. In the night, when they can’t see properly, the flying fish sometimes land aboard our boat – and then I have flying fish for breakfast. Yum yum! I have talked about some of the animals living below the water and those who live above it, but there are also some who live between the two. Velella are little animals who live on the surface of the ocean. They are like jellyfish, although they actually belong to a different group. In Latin, vela means sail, and velella are little rafts, about the size of a coin, with tiny sails rigid on them. The bottom side of the raft is covered with tiny blue tentacles, for catching food. The sail sticks up into the wind and so they are pushed along whichever way the wind goes, and they live like this, drifting around blindly, for the whole of their lives. The Portuguese man of war lives a similar kind of life, but it has a big bubble of gas to keep it afloat and upright, instead of the sail. It has very long tentacles hanging underneath the bubble, and unlike the velella (which is harmless) the Portuguese man of war can sting people as well as fish. Both the velella and the man of war are actually colonies made up of hundreds of different animals, some of which have the stinging cells while others do the digesting, and so on. The stinging cells can live on their own – until they die of hunger I suppose! 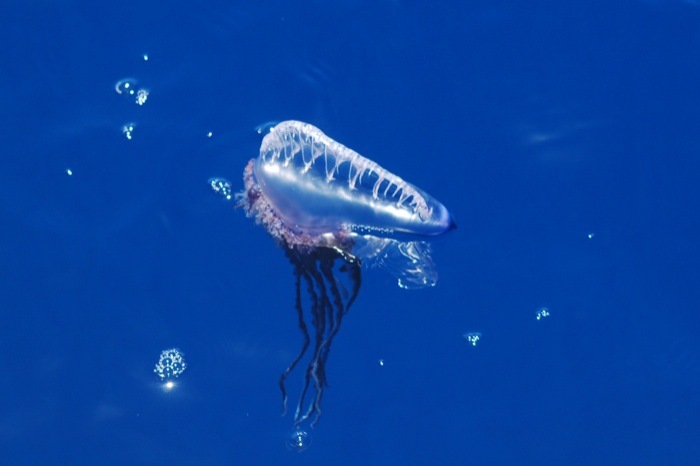 Despite the fact that the Portuguese man of war can sting and kill a man it is eaten by quite a lot of things. 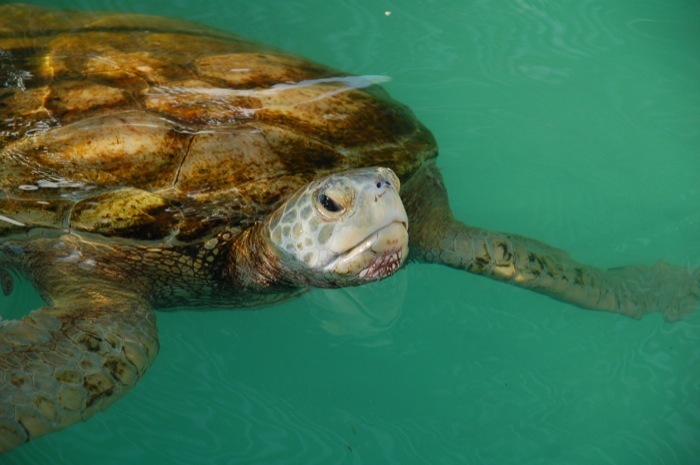 Turtles can eat Portuguese man of war and jellyfish – in fact, they are the main diet for young turtles. This is one reason why it is very important not to let plastic bags get into the water. Plastic bags floating around look just like jellyfish, and if a turtle eats one it suffocates. We saw two turtles on our way to the Canary Islands, recently, and we have seen them come into the harbours here. Some of them are loggerhead turtles. Soon we will move on from the Canary Islands, and one day we will sail Mollymawk down to the South Atlantic, where the albatross lives. 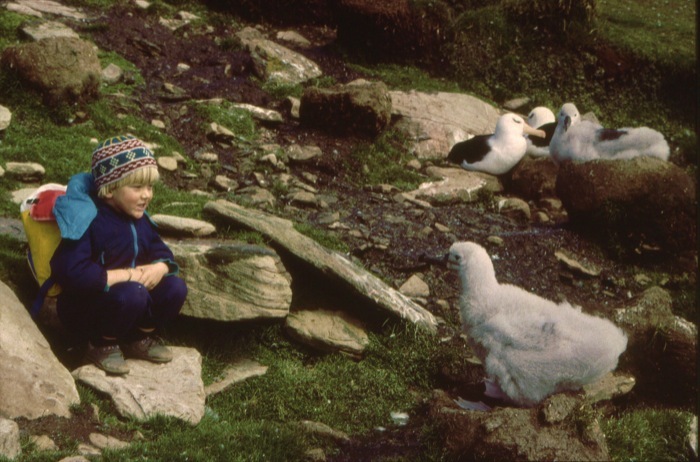 I can’t really remember seeing these beautiful birds, because I was only five years old when we sailed back up into the tropics and came north. Albatrosses are endangered species now, because they get caught on the hooks of the fishing boats, which sometimes trail twenty miles behind the boats, and then they get dragged under the water and drown. I hope there are still some mollymawks when we go there again, and perhaps when I grow up I’ll be able to do something to help them. 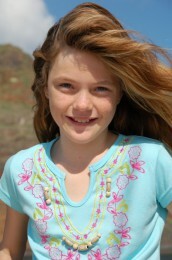 Hi to all of you! I love all your articles – Roxanne,keep up the good work,this is very interresting as I sit in an office all day,longing to do what you guys do!